Some interests spring fully formed from within, sending us off on a mission to gather information. I find that my obsessions more often evolve. I find myself returning to the same subject at completely random intervals, unintentionally or even unknowingly, until a gradual immersion occurs over time. In this way I began reading Sartre in high school because I was (and remain) obsessed with pandemic literature – of which The Plague is a brilliant example. My introduction to Borges came later via a sous chef in North Carolina who, after coming out to ask how I’d like my ostrich prepared, joined a friend and I for drinks. The discussion turned to books and the next morning I found his card on my windshield. “Ficciones” Borges written on the back. A year or two later Italo Calvino’s The Nonexistant Knight & The Cloven Viscount was passed around my circle of friends – though, thinking back, it seems impossible that I hadn’t already read If On A Winter’s Knight A Traveler. As for Oulipo, I can’t remember where I first heard that name. Perhaps Electrico W? Or the Three Percent Podcast? But Surrealism as a literary movement, separate from a visual one, came to my attention through a very specific (and completely unlikely) source – the Japanese author Kawamata Chiaki. Only in the last month did I start connecting all those books to the French College of ‘Pataphysics; a shadowy (and willfully nebulous) institution which came into being at the same time as Surrealism, and would go on to spawn Oulipo. The Conductor and Other Tales is the one and only book of fiction written by Jean Ferry – a French filmmaker, script doctor and surrealist author whose most lasting literary achievement was his critical analysis of the French literary icon and personality Raymond Roussel. * It is a collection of short stories – some only a few paragraphs in length – dealing with the fears and anxieties that are a basic ingredient in the human psyche. They are the stuff we deal with in nightmares (normal nightmares, not the horror shows of Wes Craven’s and George Romero’s slumber). Ferry was enmeshed with the Surrealists – exhaustion, sleep and/or dreams are mentioned by almost all his narrators. And the stories, themselves, resemble dreams – or rather, the kinds of puzzles and wordplay which surrealists love and have long represented as dreams. 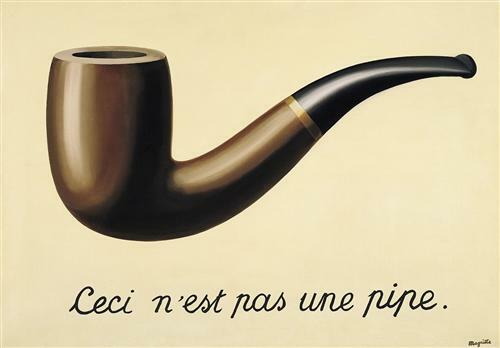 Think of Magritte’s The Treachery of Images (aka -“This is not a pipe”). 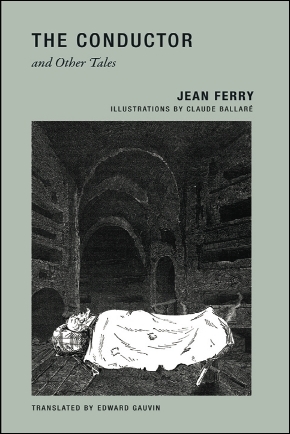 Surrealism, as does everything eventually, becomes a “type” – and these stories by Jean Ferry are of a type. But, in my opinion, they represent the best of that type. The Conductor, the story for which the collection is named and onto which André Breton lavished praise, deals with a common nightmare scenario. The narrator is a conductor on a train that never stops. Everyone – the passengers, engine crew, attendants – are trapped. There is an unlimited supply of coal and tracks, and enough food so that no one goes hungry. But no one can disembark. Ever. The conductor remembers a time when the train did stops in stations, but that seems to have been a long time ago. He can’t recall why or when things changed. He goes on to talk about how he and the passengers have come to accept the situation, the mental adjustments they have made in order to do so. Always the conductor addresses the reader directly – making you feel as if you are sitting beside him in the engine car. As if you, too, are trapped on the train with him. The Conductor bears all the hallmarks of classic Twilight Zone episodes. So much so that I actually researched online whether Ferry had ever written one himself (he had not). My Aquarium is a strange little story. The aquarium it refers to is filled with little creatures which are the physical embodiment of the narrators’s suicidal thoughts. He keeps them imprisoned in a box and feeds them like pets, hoping they will never escape. 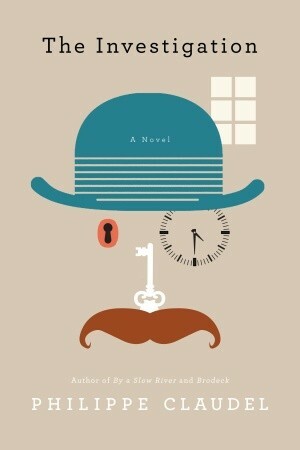 Like most of the stories in The Conductor and Other Tales, it is short. At under one page, it’s an unintentional precursor to flash fiction. The Society Tiger – perhaps Ferry’s most famous short story and one of the earliest to be translated – is the name of the vaudeville act featured in the story. A woman appears in the theater between acts, escorted to her seat by a companion: a tiger dressed in evening clothes and standing erect like a man. The two take their seats in a box visible to the entire audience and the tiger proceeds to perform the affectations of a gentleman. The narrator hates The Society Tiger – for he alone realizes that the beast is always on the edge of breaking his mental restraints and attacking the audience. It is a deeply disturbing story (particularly the ending) that seems to sympathize with the tiger. The Chinese Astrologer wears out his years calculating the date of his death. Until dawn each night he amasses signs, figures. He ages, becomes a stranger to his fellows; but his calculations advance. He reaches his goal. Astrology will reveal the date of his death. Then, one morning, the brush falls from his fingers. From loneliness, from fatigue, perhaps from regret, he dies. He had but one sum left to perform. Allow me to liken the Chinese astrologer to the intellectual who died of exhaustion at a young age for, on top of a draining, harassing, and poorly paid day job, he put his every spare moment toward preparing a monumental and definitive critical edition of Lefargue’s The Right to Be Lazy. Edward Gauvin’s translation is wonderful – written in a way which is chatty, informal and friendly. He’s kept the prose contemporary in tone, though some of the ideas and stereotypes Ferry puts forward are dated. The narrators are all storytellers and Gauvin has achieve the effect of making us feel as if we are listening to, instead of reading, the stories. He seems to be very familiar with Ferry and his fellows – not only contributing a translator’s note to the edition, but publishing numerous online articles here and here. Oh, and remember this? I’d be remiss if I didn’t mention that the physical book, itself, is charming. Wakefield Press (based in Cambridge, Massachusetts and not affiliated, to my knowledge, with the Australian publisher of the same name) is a small, independent publishing house that understands the value of a well-made product. Their books are relatively small (4-1/2″ x 7″) paperback editions with tastefully subdued covers and details such as french flaps, patterned endpapers, black & white illustrations (in the case of The Conductor and Other Tales drawn by Claude Ballaré) and beautiful formatting. Objects to be coveted by any self-respecting bibliophiles. And Wakefield seems to specialize in books by members/friends of the College of ‘Pataphysics. I recently bought both Perec’s An Attempt At Exhausting a Place In Paris and A Handbook for the Perfect Adventurer by Pierre Mac Orlan. I’ve been meaning to read something by Perec for ages – he was a character in Chiaki’s novel. Mac Orlan I’ve never heard of, but I’m almost finished with his book. Needless to say, it is wonderful. *It speaks volumes that most of my readers are at this point in the post thinking – who is Raymond Roussel? You will not find that answer here. I recommend trying here.